.Bu çalışma döviz kuru oynaklığının ihracat akımları üzerindeki uzun dönem etkisini Türkiye, Endonezya, Brezilya, Meksika, Polonya ve Şili gelişmekte olan ülkeleri özelinde incelemektedir. Döviz kuru oynaklığı, hem ARCH/GARCH modeli hem de hareketli standart sapmalar bazlı ölçümlerle elde edilmiştir. Hata düzeltme modeli sonuçları Brezilya, Endonezya ve Şili özelinde bir eşbütünleşme ilşkisinin varlığını tespit edemezken diğer ülkelerde eşbütünleşme ilişkisi bulunmuştur. İkinci olarak, dış dünya gelir düzeyi Türkiye, Meksika ve Polonya’da ihracat akımlarını etkileyen en etkili değişkendir. Üçüncü olarak, Türkiye ve Meksika’da teorik beklentilere uygun şekilde reel döviz kuru düzeyi ile ihracat akımları arasında anlamlı negatif ilişkiler bulunmuştur. Son olarak ise, döviz kuru oynaklığı Polonya’da ihracat akımlarını olumsuz etkilerken, Türkiye’de ihracat üzerinde anlamlı pozitif ilişkiler üretmektedir. This article investigates the long run impacts of exchange rate volatilities on export volumes in six developing countries, Turkey, Indonesia, Brazil, Mexico, Poland, and Chile. The exchange rate volatility is estimated by both ARCH/GARCH and moving sample standard deviation-based volatility proxies. Error correction representation of the long run export model reveals that there is not cointegration relationship for Brazil, Indonesia, and Chile while the results support the cointegration relationship for Turkey, Mexico, and Poland. Second, world income is major determinant driving export volumes in Turkey, Mexico, and Poland. Third, there is a significant negative relationship between exchange rate level and export volumes in Turkey and Mexico in line with theory. Finally, the measure of exchange rate volatility carries a significant negative coefficient in the case of Poland but a significant positive coefficient in the case of Turkey. Akaike, H. (1973). Information Theory and an Extension of the Maximum Likelihood Principle. Second International Symposium on Information Theory, Budapest: Academiai Kiado. Arize, A. C. (1995). The Effects of Exchange-rate Volatility on U.S. Exports: An Empirical Investigation, Southern Economic Journal, 62(1), 34-43. Arize, A.C., Malindretos, J. and Kasibhatla, K.M. (2003). Does Exchange Rate Volatility Depress Flows: The Case of LDCs. International Advances in Economic Research, 9(1), 7–19. Arize, A.C., Osang, T. and Slottje D.J. (2000). Exchange- Rate Volatility and Foreign Trade: Evidence From Thirteen LDCs. Journal of Business & Economic Statistics, 18:1, 10-17. Arize, A.C., Osang, T. and Slottje D.J. (2008). Exchange-rate Volatility in Latin America and Its Impact on Foreign Trade. International Review of Economics and Finance, 17(1), 33–44. Asteriou, D., Masatci, K. and Pilbeam, K. (2016). Exchange Rate Volatility and International Trade: International Evidence from the MINT Countries. Economic Modelling, 58, 133-140. Baek, J., Koo Won, W. (2009). Assessing the Exchange Rate Sensitivity of US Bilateral Agriculture Trade. Canadian Journal of Agriculture Economics, 57, p. 187-203. Bahmani-Oskooee, M. and Gelan, A. (2018). Exchange-rate Volatility and International Trade Performance: Evidence from 12 African Countries. Economic Analysis and Policy, 58, 14-21. Bahmani-Oskooee, M. and Ratha, A. (2004). Dynamics of the US Trade with Developing Countries. Journal of Developing Areas, 37(2), 1-11. Baum, C.F. and Caglayan, M. (2010). On the Sensitivity of the Volume and Volatility of Bilateral Trade Flows to Exchange Rate Uncertainty. Journal of International Money and Finance, 29(1), 79–93. Bollerslev, T. (1986). Generalized Autoregressive Conditional Heteroscedasticity. Journal of Econometrics, 31, 307–32. Chowdhury, A. R. (1993). Does Exchange Rate Volatility Depress Trade Flows? Evidence from Error-Correction Model. Review of Economics and Statistics, 75(4), 700-706. Dellas, H. and Zilberfarb, B.Z. (1993). Real Exchange Rate Volatility and International Trade: A Re-Examination of the Theory. Southern Economic Journal, 59(4), 64-647. Dickey, D.A. and Fuller, W.A. (1979). Distribution of the Estimators for Autoregressive Time Series with a Unit Root. Journal of the American Statistical Association, 74, 427–431. Doganlar, M. (2002). Estimating the Impact of Exchange Rate Volatility on Exports Evidence from Asian Countries. Applied Economics Letters, 9, 859–863. Doroodian, K. (1999). Does Exchange Rate Volatility Deter International Trade in Developing Countries? Journal of Asian Economics, 10, 465–474. Ethier, W. (1973). International Trade and the Forward Exchange Market. The American Economic Review, 63(3), 494-503. Engle, R.F. (1982). Autoregressive Conditional Heteroscedasticity with Estimates of the Variance of United Kingdom Inflation. Econometrica, 50(4), 987–1007. Engle, R. F. and Granger, C.W.J. (1987). Co-integration and Error Correction: Representation, Estimation, and Testing. Econometrica, 55(2), 251–276. Franke, G. (1991). Exchange Rate Volatility and International Trading Strategy. Journal of International Money and Finance, 10(2), 292-307. Gagnon, J.E. (1993). Exchange Rate Variability and the Level of International Trade. Journal of International Economics, 34, 269-287. Hall, S., Hondroyiannis, G., Swamy, P.A.V.B., Tavlas, G. and Ulan, M. (2010). Exchange-Rate Volatility And Export Performance: Do Emerging Market Economies Resemble Industrial Countries or Other Developing Countries? Economic Modelling, 27, 1514–1521. Hsieh, D. A. (1989). Modeling Heteroscedasticity in Daily Exchange Rates. Journal of Business and Economic Statistics, 7(3), 307–317. Hooper, P. and Kohlhagen, S. W. (1978). The Effect of Exchange Rate Uncertainty on the Prices and Volume of International Trade. Journal of lnternational Economics, 8, 483-511. Kroner, K.F. and Lastrapes, W.D. (1993). The Impact of Exchange Rate Volatility on International Trade: Reduced Form Estimates Using The GARCH-In-Mean Model. Journal of International Money and Finance, 12, 298-318. Mandelbrot, B.B. (1963), The Variation of Certain Speculative Prices. The Journal of Business, 36(4), 394-419. Mckenzie, M.D. (1998). The Impact of Exchange Rate Volatility on Australian Trade Flows. Journal of International Financial Markets, Institutions and Money, 8, 21-38. McKenzie, M.D. and Brooks, R.D. (1997). The Impact of Exchange Rate Volatility on German–US Trade Flows. Journal of International Financial Markets, Institutions and Money, 7, 73–87. Newey, W. K. and West, K.D. (1987). A Simple, Positive Semi-Definite, Heteroskedasticity and Autocorrelation Consistent Covariance Matrix. Econometrica, 55, 703–708. Nicita, A. (2013). Exchange Rates, International Trade and Trade Policies. International Economics, 135–136, 47-61. Perée, E. and Steinherr, A. (1989). Exchange Rate Uncertainty and Foreign Trade, European Economic Review, 33, 1241–1264. Pagan, A and Ullah, A. (1988), The Econometric Analysis of Models with Risk Terms. Journal of Applied Econometrics, 3, 87-105. Pesaran, M. H. and Shin, Y. (1998). An Autoregressive Distributed-Lag Modelling Approach to Cointegration Analysis. In Econometrics and Economic Theory in the 20th Century. The Ragnar Frisch Centennial Symposium, ed. S. Strøm, chap. 11, 371–413. Cambridge: Cambridge University Press. Pesaran, M.H., Shin, Y. and Smith, R.J. (2001). Bounds Testing Approaches to the Analysis of Level Relationships. Journal of Applied Econometrics, 16, 289–326. Pozo, S. (1992). Conditional Exchange Rate Volatility and the Volume of International Trade: Evidence from the Early 1900s. Review of Economics and Statistics, 74(2), 325-329. Rahmatsyah, T., Rajaguru, G. and Siregar, R.Y. (2002). Exchange-Rate Volatility, Trade and “Fixing For Life” In Thailand. Japan and World Economy, 14, 445–470. Rey, S. (2006). Effective Exchange Rate Volatility and MENA Countries' Exports to the EU. 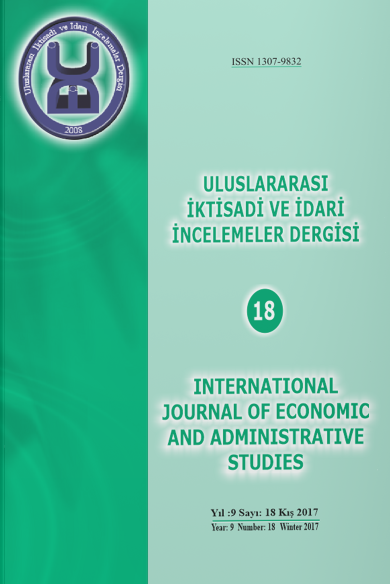 Journal of Economic Development, 31, 23–54. Sauer, C. and Bohara, A.K. (2001). Exchange Rate Volatility and Exports: Regional Differences between Developing and Industrialized Countries. Review of International Economics, 9(1), 133–152. Shapiro, S. S. and Wilk M. B. (1965). An Analysis of Variance Test for Normality (Complete Samples). Biometrika, 52, 591–611. Simsek, M. and Kadılar, C. (2006). Döviz Kurundaki Değişkenliğin Türkiye’nin İhracatına Uzun Dönemli Etkisi. Hacettepe Üniversitesi İktisadi ve İdari Bilimler Fakültesi Dergisi, 24(1), 45-68. Viaene, J.M. and De Vries, C.G. (1992). International Trade and Exchange Rate Volatility. European Economic Review, 36(6), 1311-1321. Wang, K.L. and Barrett, C.B. (2007). Estimating the Effects of Exchange Rate Volatility on Export Volumes. Journal of Agricultural and Resource Economics, 32(2), 225-255. Westerfield, J. (1977). An Examination of Foreign Exchange Risk under Fixed and Floating Rate Regimes. Journal of International Economics, 7(2), 181-200. Wolf, A. (1995). Import and Hedging Uncertainty in International Trade. Journal of Futures Markets, 15, 101-110.